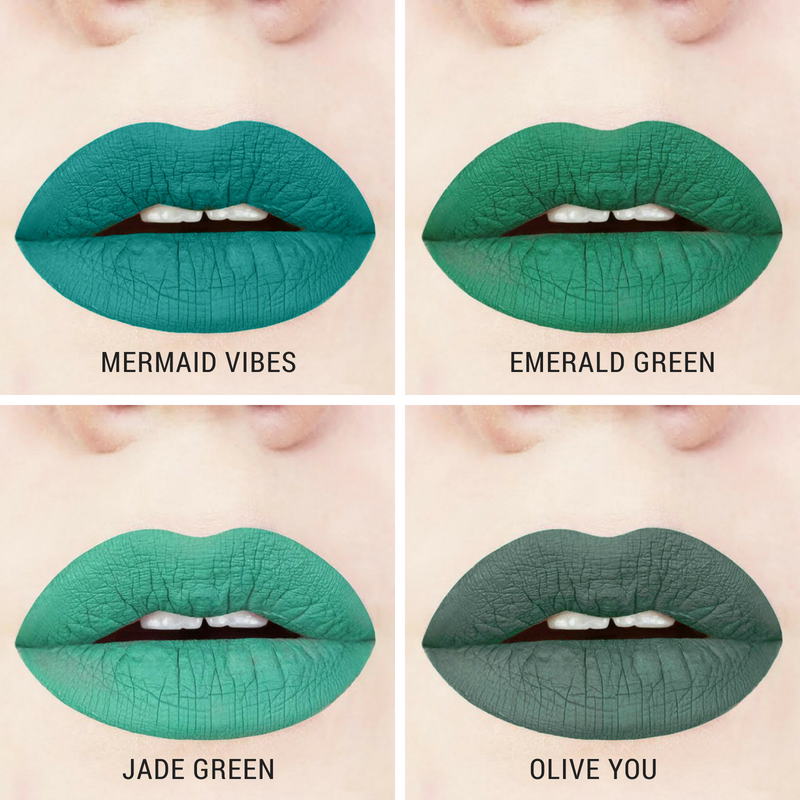 Two brand new green liquid lipstick shades - Mermaid Vibes and Olive You Liquid-to-Matte Lipstick! Almost on a daily basis, we get asked if we really sell green, blue, and other unique shades of liquid lipstick. We always respond by saying, "Yes, of course we sell green lipstick" because green lipstick is awesome! Awhile back on social media we asked what other liquid lipstick shades we should create and two of the suggestions were actually teal and olive green. 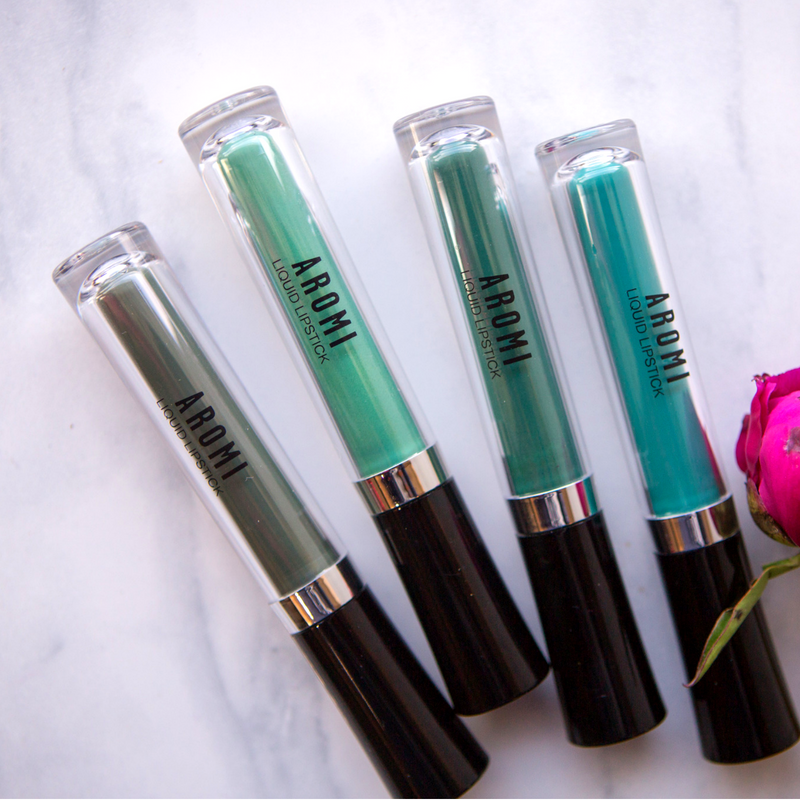 Since Aromi is all about color and we are slowly working to complete our rainbow of lipstick colors, we definitely had to add an olive green and a teal shade. 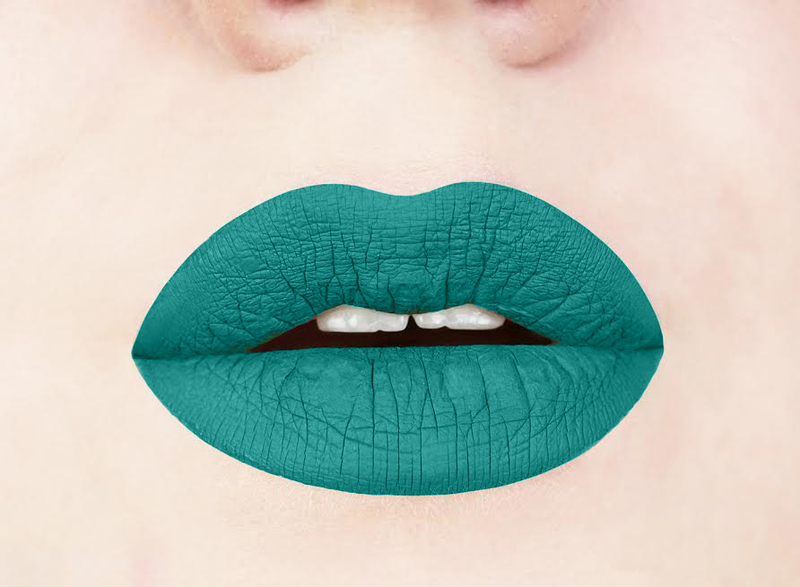 Mermaid teal liquid-to-matte lipstick has a vibrant teal shade. This blue-green shade was formulated from scratch, compounded in our own laboratory, and was even poured and packaged by hand. One of the things that makes our liquid lipsticks unique is that our products are all formulated by our very own cosmetics chemist - Aromi was actually founded by a chemist who had over a decade experience in creating formulas for different types of products. Each one of our lip colors has a proprietary formula which is unique to our brand - basically we come up with all our own formulas and colors! This is a test batch of mermaid vibes mixing up in our lab! Just like all of our other lipstick shades, mermaid vibes is 100% vegan and cruelty-free - Aromi is actually registered with both PETA and Leaping Bunny. Olive you is another one of our new liquid lipstick shades. This shade is a traditional olive green with grey undertones. We recently moved our entire laboratory and office to a new location and olive you liquid lipstick was the very first shade that was poured in our new lab. We acutally held a name contest for our new green shades and we just loved the "olive you" name suggestion! Follow us on instagram @aromi_beauty for other name contests, behind the scenes, and other photos. Olive You matte liquid lipstick - an olive-grey lipstick shade. If you've been following us for awhile, you may know that we already had two other green shades part of our matte liquid lipstick line - jade green and emerald green. We are excited to now offer a complete bundle of our four green liquid lipstick shades - this bundle includes olive you, mermaid vibes, jade green, and emerald green. If you are a fan of green lipsticks, this bundle is a way to purchase all four shades at a discount! Here are some swatches of our green liquid lipstick bundle. These swatches may help show the differences between our new and existing green lipstick shades. We hope you love the new green shades! As always, we love hearing from our customers. Because we operate our own lipstick laboratory, we have full control over what colors we create and what shades we offer - if there's a color that we do not offer or you'd like to see part of the Aromi line, let us know!